The Palm Springs International Film Festival assembles industry reps and executives from Los Angeles, film aficionados from across the country and filmmakers from around the world. The festival features filmmaker tributes, special presentations, nightly celebrations and special events and an annual Awards Gala honoring performances of the past year. The Festival screens a selection of films submitted to the Academy of Motion Picture Arts and Sciences in the Best Foreign Language film category. Nearly 70 percent of the Festival audience travels to Palm Springs from out of town. This aspect of the Palm Springs International Film Festival adds a buzz factor dynamic helpful for generating word-of-mouth about the films that are screened. A Black Tie Awards Gala will include Cocktails, dinner, awards show and after party depending on the ticket level. The Festival will present Richard Gere with the Chairman’s Award and wrap up on January 14. Running for over four decades the International Consumer Electronics Show is an annual trade show held in Las Vegas from January 8-11 focused on consumer technology. This year there will be several super session within the CES format. “Disruptive Technologies Impacting the Future of Games and Video” will be one such session and it will explore the various disruptive technologies on the horizon that will change gaming and video delivery and reshape the marketplace for products and services around games, images and on demand video. At one special event this year the Photo Imaging Manufacturers and Distributors Association (PMDA) is bringing the 47th annual PMDA Awards Ceremony to CES. PMDA will honor six individuals for outstanding contributions to the imaging industry including their Person of the Year. MIDEM Music industry convention in Cannes, France. A focus on public policy will take root at the 2013 Consumer Electronics Show during the Consumer Electronics Association’s Innovation Policy Summit with discussions from government officials including representatives from the U.S. Congress, Federal Trade Commission (FTC), Google, Verizon, as well as the Chairman and all four Commissioners from the Federal Communications Commission (FCC). Just back from a vigorous lobbying effort on behalf of the Internet during the 2012 election campaign, Internet entrepreneurs from Reddit and other prominent companies will debut their new documentary, ‘Silicon Prairie: America’s New Internet Economy’. Following the screening filmmakers and Internet entrepreneurs will discuss why government and citizens alike should care about preserving (and developing) the Internet Economy in every city and every town in America. The second annual Games Summit runs concurrently with the 2013 International CES, for one day on January 10. AFter opening remarks by Ned Sherman, CEO and Publisher, Digital Media Wire, the conference opens the agenda with ‘2013 Gaming Trends – Analyst and Expert Presentations’ with presentations that give an overview of the latest research that reflects and illustrates the current state of gaming and the directions in which the industry is heading. Throughout the conference, executives from the electronics industry, game publishers, game developers, advertising agencies, investment firms and social networks will discuss industry trends and share insights about the future of games and connected entertainment. Luxembourg-based Europe4StartUps, a non-profit organization, will be staging a contest through the Digital Media Wire community. The offer is part of the Europe4Startups campaign which over the next year will award grants to 12 digital media companies, two of which will be digital games companies selected from the DMW community. Recipients will receive a 12-month package, including premium cloud computing services and a suite of business, legal and marketing services. The 70th Annual Golden Globe Awards will go live January 13 from Los Angeles with a live telecast airing over the NBC television network at 8 pm (EST). Originated in the 1940’s during World War II, the HFPA was originally comprised of a handful of LA based overseas journalists. Since those beginnings, the organization holds what is regarded as the third most watched awards show on television, the Golden Globe Awards, which have enabled the organization to donate more than $12 million to entertainment related charities and scholarship programs. Actor, director and producer Jodie Foster will receive the Cecil B. de Mille for lifetime achievement at this year’s Awards. Chosen by the HFPA Board of Directors, the Cecil B. DeMille Award is given annually to the talented individuals who have made an impact on the world of entertainment. Morgan Freeman was handed the honor last year and previous honorees include Lucille Ball, Bette Davis, Walt Disney, Harrison Ford, Judy Garland, Audrey Hepburn, Sophia Loren, Robert De Niro, Al Pacino, Martin Scorsese, Frank Sinatra, Steven Spielberg, Barbra Streisand, among others. Tina Fey and Amy Poehler host the 70th Golden Globe Awards. The annual Sundance Film Festival is set to open in Park City, organized and run by Sundance Institute, a nonprofit organization dedicated to the discovery and development of independent artists and audiences. Originally founded by actor Robert Redford in the mountains of Sundance, Utah, the Institute seeks to discover, support, and inspire independent film and theatre artists from the United States and around the world. In addition to Park City, films will be screened in Salt Lake City, Ogden and Sundance. This year’s festival which runs January 17-27 will screen 115 feature-length films representing 32 countries – the majority includes projects from 51 first-time filmmakers, including 27 films that are in competition. In addition to discovering filmmaking’s newest talents through Sundance Festival’s film screenings, Festivalgoers can experience live music performances, panel discussions such as “Tupac, Elvis, and Benjamin Button Walk into a Bar…” a discussion on the impact of digital characters on filmmaking, live performance, and intellectual property, a topic inspired by the “Digillusion” event when a digital version of Tupac Shakur did a surprise performance at Coachella and the crowd reaction to it. Festival goers can visit the Salt Lake City Cafe during the day to hear a range of songwriters and artists from across the musical spectrum take part in a program produced by the American Society of Composers, Authors and Publishers (ASCAP). The highly anticipated Steve Jobs biopic, jOBS, starring Ashton Kutcher, will close the 2013 Sundance Film Festival. Similar to the Sundance Festival in certain regards, Slamdance also serves as a showcase for the discovery of new and emerging independent artists and is dedicated to the nurturing and development of their vision. And it is also based in Park City, although festival runs dates will be January 18-24, ending some days before Sundance concludes. Now in its eighteenth year as a festival that runs simultaneous to the Sundance Film Festival, the Festival showcases films in every genre, on any topic from every country around the world. The festival program is selected completely from blind submissions and does not disqualify any films based on premiere status or date of completion. As always, the Slamdance Screenwriting and Teleplay Competition is aimed at discovering and supporting emerging writing talent. Every year the Festival shows a Special Screening program comprised of several independent feature films by established filmmakers. This Special Screening program is non-competitive and sometimes includes films made by Slamdance alumni. The National Association of Music Merchants Show (NAMM) is a trade-only event in Anaheim that is not open to the general public because of its B2B orientation. It is held bi-annually and will be held January 24-27 during this winter session and again in July in Nashville. There is also a NAMM Russia in May. As The show brings together all facets of the music products industry, buyers attend looking to find new state-of-the-art products, and exhibitors can connect with customers that are their target audience. The open lobby will play host to an exclusive Member Center, digital media hub, new product showcases and more. NAMM U, the learning and education arm of the convention, starts with NAMM U Online, a full and varied library of videos, articles and interviews that supplement the popular live Breakfast Sessions and Idea Center Sessions at the NAMM Shows; Breakfast Sessions, with industry insiders sharing their thoughts, ideas, and strategies for doing business in today’s aggressive marketplace, happening every morning before the show floor opens; Idea Center Sessions, which are short, focused “How to” sessions that take place right on the show floor and start every 30 minutes. Since 1967, the annual MIDEM – acronym for Marche International du Disque et de l’Edition Musicale – has been an international B2B event in, Cannes Cedex, encompassing tradeshow, conferences, competitions, networking events, performances, as well as a platform for showcasing new artists, musical trends and music-related products and conferences educating about the music industry and new revenue streams. Since 2000, the night before MIDEM opens, the Palais des Festivals hosts the NRJ Music Awards. The awards ceremony is organised by NRJ, a French multimedia conglomerate that owns France’s most popular music station. 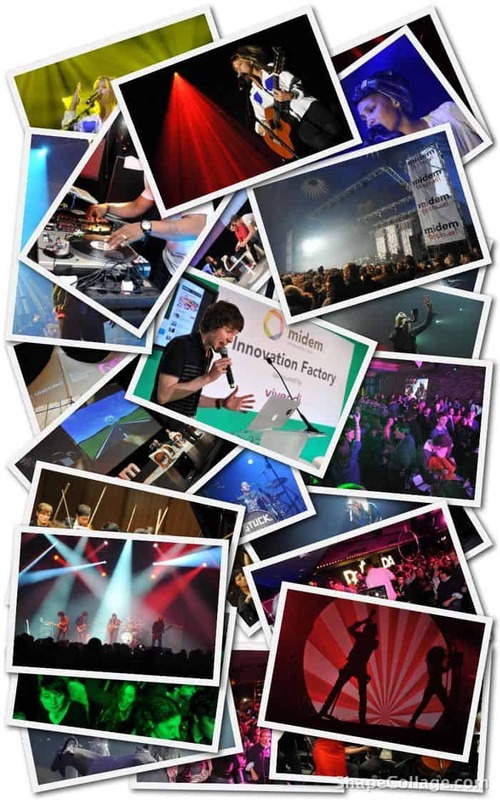 This year, MIDEM’s Innovation Factory Zone is dedicated to discovering the latest cutting edge technologies through live demo sessions, training and mentoring with international experts. Music Pitch Sessions at MIDEM’s Brand Central division will have thousands of music professionals present to track and find new music relevant for their upcoming projects. Reed MIDEM is the owner and organizer of the annual MIDEM conference. Broadcast Engineering Society-BES Expo is a Conference and Exhibition (BES Expo) on Terrestrial and Satellite Broadcasting which will be held in New Delhi on January 29-31. The theme for the 2013 Expo will be convergence and new broadcasting technologies. It is focused on manufacturers, dealers, distributors and suppliers of products, equipment, systems and services related to terrestrial and satellite broadcasting for radio, TV, studio and post-production. Equipment and technology which can be displayed in the expo includes, but is not limited to: cable, video, audio, multimedia, broadband, networking, automation, Video Streaming, Graphics and Animation, production and post production, archiving. A three-day conference on the theme “Convergence and New Broadcasting Technologies” happens at the same time as the exhibition in Hall 12. The Broadcast Engineering Society, headquartered in New Delhi and with 10 local chapters across India, was established in 1987 and is a founding member of the Engineering Council of India, New Delhi. The Society is affiliated with the Society of Broadcast Engineers and it has a friendship agreement with the Society of Cable Television Engineers and National Association of Broadcasters in North America. The Florida Media Market (FMM) was created to be an outlet for South Florida independent Filmmakers to meet with executives producers, production companies, distributors, TV Networks and Stations, that are actively seeking content either by producing, co-producing or purchasing. FMM is also designed to serve as a meeting place where new filmmakers can gain valuable insight from industry veterans and established companies. To that end FMM has created both an annual market, and an online platform for buyers and sellers of film, documentary, television, and new media content to gather in order to teach, learn, inspire and do business together. The above events are only a sample of what is fully listed. Complete details are on the “Media, Entertainment and Performing Arts Industry News and Events” page which now has pages translated into 10 of the most widely used international languages that can be accessed from the blog page. This month’s photo placement highlights the MIDEM music convention in Cannes, France. If the photo does not appear in this post please visit the blog page to view it there. Looking ahead into the next month be aware that: the European Spiritual Film Festival will be in Glasgow, The Event Production Show 2013 will be held in London, The Berlinale Festival will take place in Berlin, a combined Digital Music Forum East and West – forming DMW Music – comes to New York City, The Editors Retreat for TV, video and film editors will be given in Riviera Cancun.